Doris Cain had been married before she joined the WAVES in 1944. The marriage ended badly and she decided to enlist so she wouldn’t see her husband in the small farming community where they lived (he was deferred from military service because of the farm). He was wearing a Marine uniform when I met him. He made a date with me to pick me up for dinner or something, and he picked me up in a sailor uniform. I was really amazed because I didn’t know you could interchange uniforms like that. I almost quit going with him. We were working in a tight secure environment. I didn’t want to have anything to do with somebody who was messing around, do you know what I mean? Well, you don’t know if they’re spies or if they’re crazy or what. So I went out with him for dinner but I wouldn’t make another date or anything. He kept bugging me. “Why? Why?” And I told him. I said, “Because you wear a Marine uniform one time and a sailor uniform.” That’s when he told me that the Marines don’t have a medical department and the Navy supplies medical for them. He was stationed at Camp LeJeune, North Carolina. That’s the reason he could go in either uniform. He wears a Navy patch in the Marine uniform that shows he’s a pharmacist. But outside of that you can’t tell. Doris’ pharmacist’s mate was persistent. They began going out, and he began asking her to marry him. He proposed to me, but I wasn’t sure that I wanted to get married again. I told him, I says, “I don’t love you.” And he said, “But I can make you love me.” So I married him. By this point it was late 1945 and the war was over. Doris left the service and she and her pharmacist’s mate got married shortly after. Once he was out of the military, they moved to California and had two children. 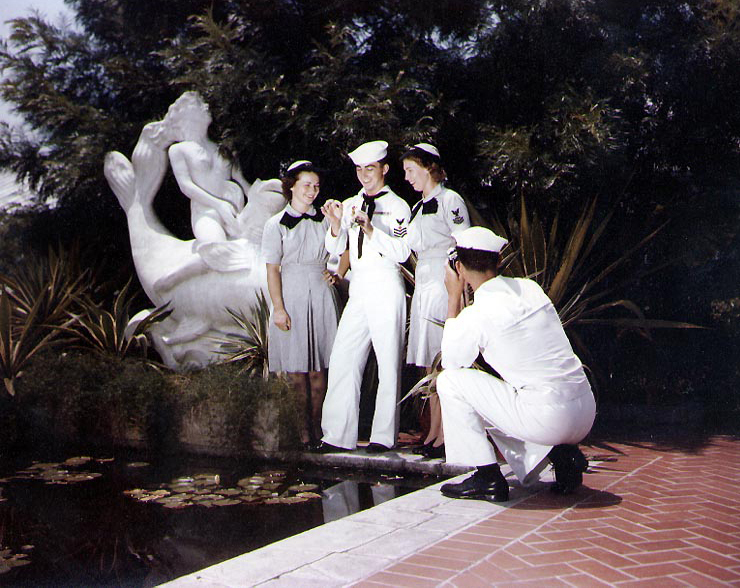 This photograph, “She Loves Me, She Loves Me Not,” shows WAVES and sailors on liberty in New Orleans, LA, c. 1944. It comes from the Naval History and Heritage Command.